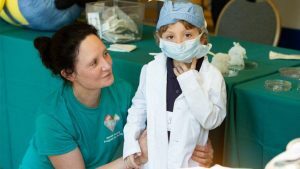 Mayo Clinic and The Children's Hospital at OU Medicine in Oklahoma City are collaborating within a consortium to help patients with hypoplastic left heart syndrome, also known as HLHS, a rare and complex form of congenital heart disease in which the left side of the heart is severely underdeveloped. The collaboration is expanding the development of cell-based, innovative research opportunities to transform the lives of people living with hypoplastic left heart syndrome. The Children's Hospital at OU Medicine has been involved with the hypoplastic left heart syndrome program since 2015 and performed its first umbilical cord blood cell delivery in 2016, according to Timothy Nelson, M.D., Ph.D., director of Mayo Clinic's Todd and Karen Wanek Family Program for Hypoplastic Left Heart Syndrome. "We're thrilled that they've joined the consortium because it means that individuals with hypoplastic left heart syndrome will now have more access to participating in groundbreaking clinical trials," Dr. Nelson says. This brings the total number of Hypoplastic Left Heart Syndrome Consortium members to six: Mayo Clinic, Children's Hospital of Philadelphia, Children's Hospital of Los Angeles, Children's Minnesota, Children's Hospital Colorado, and The Children's Hospital at OU Medicine. Harold Burkhart, M.D., who leads the pediatric cardiothoracic surgery team at OU Medicine, says being a member of the consortium establishes Oklahoma as a regional center for families to receive care closer to home. "Families of children with heart anomalies want to know that we're not just resting where we are," Dr. Burkhart says. "We need to keep pushing forward to come up with newer treatments. This collaboration provides new hope for patients and it is the epitome of a bench-to-bedside research project." Read the full announcement on the Mayo Clinic News Network.